Carpets are a breeding ground for bacteria — the fibers are a catchall for dirt, dust mites, pet hair, pet urine, dead skin, mold, and other disgusting details. To get rid of the gross, potentially harmful bacteria hiding in your carpet, you need to have your carpet professionally cleaned. A professional carpet cleaning will eliminate your carpet’s health hazards; however, buyer beware because some companies charge more than what you should be paying. Here’s how you can get a professional cleaning without overpaying. 1. Per Room Rate: Some professional carpet cleaning services charge per room, offering a flat rate for each room in a home. According to Angie’s List¹, a professional carpet cleaning costs an average of $51 per room. It’s important to ask the company if they have a size cap, because some companies may treat one room as two if it goes over the maximum square footage. 2. Square Footage Rate: Cleaning companies may charge per square foot, basing their rate on the amount of carpet in need of cleaning. The company will visit your home to make an estimate based on measurements they take. Home Advisor² reports that a square footage between 1000 and 3000 square feet can cost between $200 to $550. Surprisingly, if your place is smaller (a one- to two-bedroom home) you might pay more because the cleaning company needs to offset its travel and material expenses. According to Home Advisor³, on average, homeowners living in a mid-sized home report paying anywhere between $122 and $233 for carpet cleaning. Before your rate is set and your home is assessed or measured by your chosen carpet cleaning company, there’s one more thing to consider: additional factors that could drive up the price of carpet cleaning. Different companies use different cleaning methods and equipment, and this can take the cost of a professional cleaning from affordable to exorbitant. 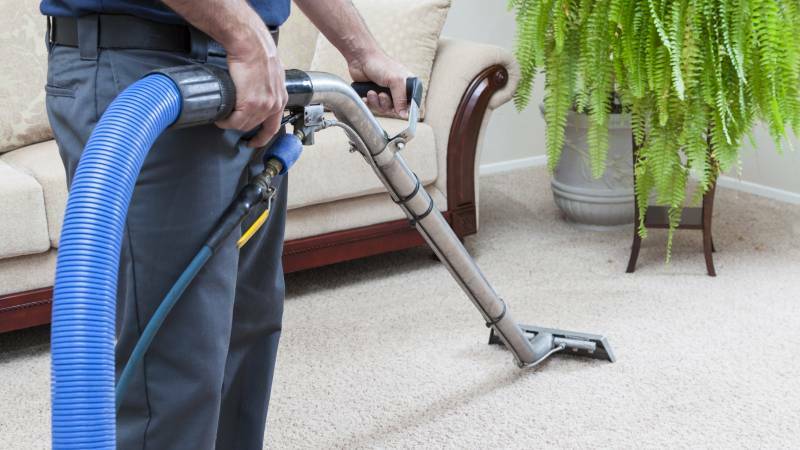 Steam Cleaning: This is the most popular method professional carpet cleaners use. The method includes using high pressure to push hot water with a cleaning solution into the carpet, which loosens dirt and debris. The moisture is then suctioned up by a machine and the carpet will need 24 hours to dry. Steam cleaning, Home Advisor⁴ reports, can cost anywhere between $100 for up to 1,000 sq. ft. to $500 for up to 2,000 sq. ft.
Dry Cleaning: This method is also known as “low moisture” or “encapsulating” cleaning. It uses chemicals and a small amount of water to clean your carpet, and it’s quicker than steam cleaning. It uses a rotary machine to loosen dirt and immediately suctions dirt and debris. To put it in perspective, Home Advisor⁵ notes that dry carpet cleaning for a 2,200 sq. ft home ranges from $323 to $600. DIY Carpet Cleaning: An option that can be significantly cheaper is renting a carpet cleaner from a local retailer and tackling the job yourself. A steam cleaner rental can cost anywhere from $35 to $50 per day, Home Advisor⁵ reports, plus the cost of the cleaning solution. In addition to the cleaning method, you’ll want to consider other factors within your home that could add hundreds of dollars to your carpet cleaning total. Professionally cleaning carpeted staircases can add an extra $2 to $3 per stair according to Cost Helper⁶, while stain removal can add $0.10 per square foot and cost you as much as $30 per 300 square feet. If you have heavy furniture that needs to be moved, you could be out even more cash. In order to keep professional carpet cleaning affordable, make sure you ask about these additional factors and add-on costs before signing on the dotted line. You don’t want to see a surprise that costs you $100 or more once the job is done. If you’re considering getting your carpet professionally cleaned, there’s one important first step to take: get an estimate. It doesn’t cost you a cent – most companies will come to your home and provide a free estimate. That free estimate gives you the chance to ask about the company’s cleaning methods, pricing, and additional services before you agree to have the job done. A free estimate is the perfect way to do your research and choose a company within your price range. Few homeowners have professional carpet cleaning experience, and your carpet will be at its very cleanest if you turn to a professional company with years of expert knowledge. A carpet cleaning company will be able to determine which cleaning method is best for your home and carpet, as well as what cleaning products work best. Take the first step today and have a local carpet cleaning professional come and assess your home. Interested in professional carpet cleaning? Start a search today.